Two roads diverged in LAUSD, one leads to a massive New Deal style reinvestment in our public schools saving the lives of tens of thousands of students, and the other to layoffs, school closures and reductions in student services. In a series of visits to West LA schools, the billionaire’s candidate, Democrat Nick Melvoin has demonstrated he is sprinting down the second path while trying to manufacture consent for the privatization agenda. 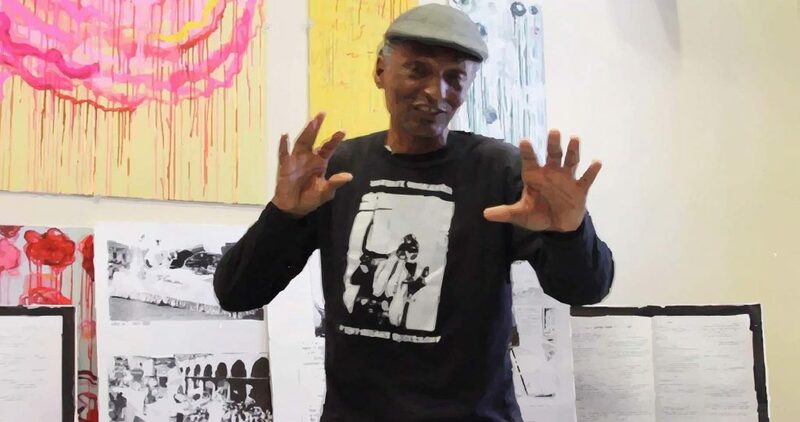 LAUSD teachers are critical thinkers so he does not fool us. From September to October, Melvoin visited Broadway, Grandview and Venice High to tell parents in English only, the school district could not afford to make vital improvements to learning conditions such as reducing class size, hiring more nurses, counselors and psychologists because there are no resources to do so. This despite the fact the district sits on a record $1.86 billion dollar surplus, enough to hire 15,000 new employees, give a cost of living adjustment to all workers and have money to spare. Melvoin did not bring interpretation services to any of these meetings despite the large percentage of parents at each school site who speak Spanish only. All LAUSD parents need to be able to access these vital meetings where education policy is being discussed. Their students are here so their voices matter, and Nick is ignoring them. At Venice High, administration told teachers prior to Nick’s visit that the school board and the superintendent did not want them speaking to parents on campus about labor negotiations only to then witness Melvoin come to our campus and trash the teacher’s union. Silencing critical voices is undemocratic but teachers have asserted their legal and constitutional right to communicate with parents during non-instructional time on campus about matters of public concern. We produced this written reply to Melvoin’s misleading presentation to ensure we are heard so the public can better discern a course of action. The truth must be told. The civic institution of public education is under attack by a scheme to privatize the system. Those who support the privatization agenda, like Eli Broad, are the people who backed Melvoin’s campaign, the most expensive school board race in U.S. history. This is the reason public schools are not being fully funded like they used to be and the district sits on almost $2 billion of surplus funds while schools go without improvements. 10,000 new educators at $110,000 (total compensation) could be hired now with $1.1 billion and the surplus would still exist! That would be a serious class size reduction. But how would that benefit the charter schools along with their colocations? We have super large class sizes, a lack of nurses, psychologists, counselors and instructional materials. Parents have to constantly fundraise to get things the school districts used to pay for. In less affluent neighborhoods this is an impossibility. We know our at-risk students suffer the most under this neglect. LAUSD diverts close to $600 million a year from the general fund to private charters. We are in the middle of a long-term plan to privatize public education. The latest contract offer actually calls for increasing class size if any of 9 economic triggers happen, which is basically a certainty. How can LA charter schools advertise their classes are capped at 30 while LA public schools have no limits to class size? The vast majority of public school teachers believe in a fully funded public system so that every child in Los Angeles has a world class education within walking distance of their home. Nick stated there is a $15 billion dollar liability for healthcare which handcuffs the district from taking on any new costs. He is talking about a 30-year liability like it’s a bill that’s due tomorrow and stating the district’s reserves have to be set aside for those future expenses. That is like someone claiming bankruptcy because they need $500,000 today to pay for their 30-year-mortgage so they cannot put their kid in college. There is a big difference between the accrued accounting liability and the actual yearly cost of the plans which are accounted for in the regular budget. Plan obligations are paid over many years, thus the system provides time to generate contributions (from employees, employers, and the state) and investment returns as well as time to alter related financing arrangements. For example, since 2015, California teachers are now contributing 2% more of their salaries into the retirement system. Discussing a plan’s unfunded liability by focusing solely on a figure that describes a projected price-tag 30 years in the future does not allow the public to benefit from an understanding of how the system actually works. Instead of focusing on a projected bill 30 years away, lets focus on things that are draining funds away from student services right now, such as the $600 million a year lost to private charter expansion, or the increasing special education costs due to charter’s selective enrollment practices which leaves the public schools with an ever-increasing percentage of special-needs students. Nick says LAUSD has a structural deficit in that it takes in less than it spends on a yearly basis. Again, this is based on a projection. The very recent historical data shows that LAUSD is actually accumulating a large surplus while the district claims a crisis and schools are left underfunded. An examination of the past five years of LAUSD budgets demonstrates a steadily increasing ending balance from 2013- 2018. The ending balance for 2016-2017 was $1.765 billion and for 2018-2019, $1.83 billion, which amounts to 26.5% of the budget. UTLA have researchers who have worked hard to study these public budgets. Teachers are not inventing “alternative facts” as Melvoin suggested at VHS. We find it egregious that this money sits in an LA County Treasury account while the students are deprived of badly needed resources. New York Public Schools which serves even more students, only keeps 1% of their budget on reserve. The State of California requires school districts to keep only 1% on reserve, or $75 million. Nick says teachers are being offered a 6% raise that they are refusing. This is not a 6% raise, it is a partial salary restoration. UTLA is demanding a 6.5% salary restoration to make up for the last 3 years of inflation in which teachers did not get any cost of living adjustments like most government employees. The actual offer from the district when Mevoin was here last month was 3% and another possible 3% next year if the funds are available. It is now 6% contingent on extra work duties and reduced retirement options for new hires. This latest offer is also being misrepresented by the board and superintendent as having no contingencies. When salaries are not adjusted for inflation each year that means the payee actually takes a pay cut due to inflation. All we are asking for is to keep pace with inflation so we can at least maintain our standard of living in this expensive city. We are public servants and do not receive “raises” like those in the private sector. An example of an actual raise that increased buying power is the 174% increase the board voted for themselves last year! The state provides LAUSD with Cost of Living Adjustment (COLA) monies every year to pass on to the workforce. This is part of state law, yet LAUSD, unlike most other surrounding districts does not pass on this COLA adjustment to its workforce. The result is that it becomes more difficult for LAUSD teachers to live in the communities where they work. We have recently lost some good teachers at Venice High to the surrounding districts that pay as much as 20% more. Nick made an emphatic point that teachers just received a 10% raise in 2015. Again, this was a partial salary restoration, not a raise, because it left teachers still way behind inflation. We went 8 years with zero cost of living adjustments from 2007-2015. UTLA’s demand during those negotiations was a 17% salary restoration to make up for the 8 years. The financial strain on teachers was exacerbated by the many furlough days taken during 2010 and 2011. Cost of living in Los Angeles has increased 27% since 2007. In that time, teacher pay has only increased 10%. Currently, LAUSD teachers are 17% behind inflation from 2007. With the district’s 6% offer we will still remain 7% behind inflation from 2007. It is reasonable that public servants demand their standard of living does not deteriorate year after year, especially as their workloads continue to increase. Nick’s major theme was that although teacher’s demands are reasonable, they cannot be met due to the financial situation of the district. A number of UTLA demands will actually save the district tons of money. First is charter accountability. 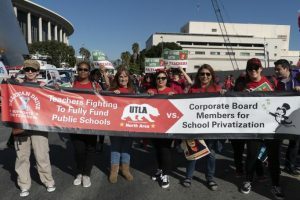 Private charter expansion cost LAUSD close to $600 million a year https://www.utla.net/news/charter- schools-cost-lausd-half-billion-last-year-report-claims. UTLA’s proposals would slow down charter expansion by requiring an Education Impact Report as part of the authorization process for new charter schools and the reauthorization of existing schools. The demands also require district authorized charter schools provide annual data on student demographics, dismissals, expulsions and enrollment and ensure co-locations do not diminish the learning opportunities of Public School students. Decreasing the number of standardized tests would also save the district millions of dollars a year. We are asking that teachers have discretion to determine when and/or what standardized assessments are used in their classrooms beyond those required by the state or federal government. Currently LAUSD mandates many more standardized tests than the state and federal government require. The average LAUSD student will have taken over 100 standardized tests by the time they finish 3rd grade.